Prophet Nostradamus, who accurately predicted Hitler and 9/11, claims that World War 3 will start in 2019. According to the infamous seer, 2019 is set to be the start of 27 years of misery around the globe. Mirror.co.uk reports: And it’s not likely to get better until at least 2046 if he’s proven to be right. 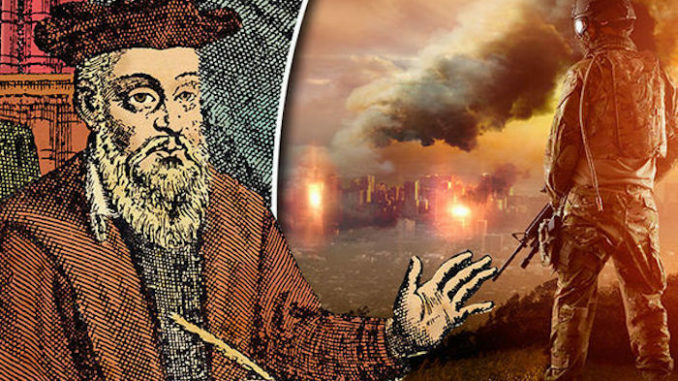 In his 1555 book Les Propheties, French seer Nostradamus tipped 2019 to be the begging of an apocalyptic war that would span nearly three decades. The book, compiled of 942 poetic quatrains that allegedly predict future events, also believes floods will swell across much of Europe, as well as a catastrophic earthquake erupting between California and Vancouver Island, in Canada. Terrorism and religious extremism is also tipped to increase in the Middle East. It isn’t all bad though. The poetic clairvoyant did suggest political leaders would come together to battle climate change, as well as scientists developing a medicine that could allow us to live for 200 years. In the text of his book, each four-line block, called a quatrain, attempts to predict an event in the future. While logic might suggest Nostradamus’ claims could apply to almost anything, some of the coded verses do seem oddly specifc. On Sept. 2, 1666, a small bakery fire on Pudding Lane in London kick-started a vicious inferno that ravished the city for three days. The phrase “Blood of the just” is believed to refer to the elimination of millions of flea-carrying rats that spread the Black Death. That deadly plague died out during the Great Fire. Many also credit the prophet for foreseeing Hitler’s rise to power. Hitler was born to poor parents in 1889 in Western Europe and used public speaking skills to assemble support the Nazi party after World War I. He also allied with Japan – or the ‘East’ – in the second world war. While many believe “Hister” to be a misspelling, it’s also an old name for the Danube River in Austria. Incredibly, Hitler was born just miles from that river. Nostradamus has, however, also bizarrely predicted that humans will develop the ability to speak to animals. And if his prediction that the world would end by 1999 is any thing to go by – it’s clear he isn’t always right.